As many of will you know by now, I’m like a magnet for these beautiful Pushkin Collection books from Pushkin Press. Last year I bought Subtly Worded, a collection of short stories by Teffi (a pen name for the Russian author, Nadezhda Alexandrovna Lokhvitskaya). I was planning to post this review in August to link up with Biblibio’s Women in Translation event, but I accidentally pressed ‘publish’ while drafting it yesterday! My #WITMonth has started a little early. Teffi was born in 1872 into an esteemed and cultured St Petersburg family. During her literary career she wrote satirical articles and plays, but by the age of 40 she was publishing mostly short stories. In 1919, in the midst of the Russian Civil War, Teffi left Russia for Europe, eventually settling in Paris where she became a prominent figure in the émigré literary circles. The stories in Subtly Worded are grouped into five sections covering various periods in Teffi’s life starting with her early stories written before the Russian Revolution through to later stories of life as an émigré in Paris. The collection closes with a series of haunting works from the period prior to her death in 1952. As with other short story collections I’ve reviewed, I’m not going to try to cover each story in turn – rather, my aim is to give a flavour of themes along with some thoughts on the collection as a whole. The poet was someone very interesting. ‘The Hat’ also offers a sharp and witty insight into the ability of a stylish new hat (or any such article of clothing) to alter a woman’s mood. In this scene, Varenka is admiring herself in her new hat, ‘a deep-blue hat with a deep-blue bow and a deep-blue bird, a true bluebird of happiness.’ She is anticipating the arrival of her friend, the poet with no poems. This story, which ends on an amusing note, seems to typify much of Teffi’s work from this period. There are one or two more poignant pieces too. ‘The Lifeless Beast’ tells of a young girl who feels desperately lonely at home due to a breakdown in relations between her mother and father. Her only friend is a soft toy – a stuffed ram that she longs to bring to life. But as the weeks pass by, and the ram turns grubby and worn he becomes a metaphor for the parents’ decaying marriage. The second group of stories, those covering the period 1916-19, are especially interesting. ‘One Day in the Future’ takes a satirical look at the Communist movement. It describes a world where the old social orders are a reversed: doctors are reduced to the roles of servants; vice-admirals act as couriers; draymen and watchmen are elevated to a higher status. His doorman had once been a singer at the Imperial Theatre. With the graceful magnificence of Verdi’s Don Carlos, he flung open the doors before Terenty. Rasputin is drawn to Teffi and cannot understand why she fails to respond to his charms – he is clearly not accustomed to meeting such resistance from anyone, let alone a woman. Teffi detects something deeply unpleasant and chilling about the atmosphere surrounding Rasputin: ‘the grovelling, the collective hysteria – and at the same time the machinations of something dark, something very dark beyond our knowledge.’ There is the sense that one could quite easily fall under his hypnotic spell and never be able to break free from it. Several of the remaining stories in this section are shot through with a strong sense of nostalgia, a deep longing for the days of Teffi’s childhood in her beloved homeland. Section IV contains two Magic Tales from the 1930s, including ‘The Dog (A Story from a Stranger)’. This is another highlight of the collection, a haunting story that feels grounded in truth. In this extract, Teffi recalls a time during the Civil War. The final stories in this collection are deeply melancholic in tone. Once again, there is a strong sense that Teffi is drawing on her own life experience. This is especially clear in ‘And Time Was No More’, a poignant tale of dreams reaching back into the author’s time in St Petersburg. Subtly Worded is a fascinating collection, notable for the sheer variety of stories it contains. What makes these pieces particularly intriguing is their connection to various aspects of Teffi’s own life and experience. Subtly Worded is another gem from Pushkin Press, one of my go-to publishers for interesting literature in translation. Grant (1streading) and Karen (Kaggsy’s Bookish Ramblings) have also reviewed this excellent collection. Subtly Worded by Teffi (tr. Anne Marie Jackson with Robert and Elizabeth Chandler, Clare Kitson, Irina Steinberg and Natalia Wase) is published in the UK by Pushkin Press. Source: personal copy. Book 3/20, #TBR20 round 2. This entry was posted in Book Reviews, Teffi, Women in Translation and tagged #ReadWomen, #TBR20, #TranslationThurs, #WITMonth, Anne Marie Jackson, Book Review, Fiction, Literature in Translation, Russia, Teffi, Women in Translation on July 12, 2015 by JacquiWine. I’ve never heard of this but it certainly sounds like one to look out for. Thanks for another great review, Jacqui. Very welcome, Naomi. I think it’s a really interesting collection, quite eye-opening in many ways. Are you thinking of reading something for this year’s #WITMonth? I am! I don’t know if I’ll be able to do much early stuff as suggested by Meytal, although I have got some Margarita Karapanou. I’ve got a couple of Deep Vellum titles which I should’ve read ages ago, ditto Ferrante book three and I bought Alina Bronsky’s first book and La Femme de Gilles on Friday. I’ve also still got a stack of books left from last year. We’ll see how far I get in the chaos that is my life at the moment though! Great stuff, lots of intriguing choices there! I’ve never heard of Margarita Karapanou…just about to go and check her out. The Alina Bronsky sounds like a winner – I recall seeing quite a lot of praise for it at the time. Oh, and I’ll be fascinated to see what you make of number three in Ferrante’s Neapolitan series…let me know what you think once you’ve read it. The poet without any poems sounds a bit close for comfort… but yes, I can appreciate the irony! Sounds really interesting, thank you for the introduction. Difficult to get hold of? Haha! Well, luckily that description doesn’t apply to you! The poet WITH poems. I think you’d enjoy this collection, Marina. I’m not sure how easy it would be to get hold a physical copy in France, but it is available in ebook format. The book is Dan Yack by Blaise Cendrars – very odd and strange but quite compelling. That’s a new one on me! Sounds rather intriguing, I hope you’ll review it. I will eventually – I’m just a wee bit behind with the reviews, but it will turn up on here in due course! This does sound like an appealing collection of stories. I was lucky enough to see this as a kindle daily deal for 99p a year or so ago. I wonder if Pushkin have any plans to publish any more as there doesn’t appear to be too much of her work available in English. It’s such an absorbing collection, all the more fascinating for the diversity of pieces included here. I think it would make a good contrast to the Checkov collection you’ve just reviewed as the tone is quite different, especially in the early stories which have a lightness of touch. She sounds like one of those writers who simply have to reflect the conditions of their time to be interesting. A fascinating group of people in Paris between the wars, and it;s interesting how often the Russians figure in it. I think you’re probably right – it’s the events of the time and Teffi’s own personal experiences that bring certain aspects of this collection to life. The (semi-)autobiographical pieces are the standouts. It would have been fascinating to hear more about the literary set she mingled with in Paris, and I wonder if there might be other stories from that period (other than those included here). The Hat immediately reminded me of Kazuo Ishiguro’s story Cellists in his excellent collection Nocturnes:Five Stories of Music and Nightfall, in that story, a woman claims to be a world famous cellist, her pure talent unspoiled by ever having played a note. I’m going to have to look out for more of Pushkin’s titles, I love the sound of this one and am intrigued by their collection. A lovely review and well chosen quotes, thank you Jacqui. As for Pushkin Press, I don’t think you can go wrong with their books. I’ve yet to be disappointed. On a really lovely sounding collection. Pushkin press editions do look lovely too. I really enjoyed this collection. Ali. The Pushkin Collection editions are beautiful, very covetable. I’m so excited about this book! I’ve got it waiting for me just a few Russian authors down the line. It’s good to have such a great preview of the treats ahead – thank you! I accidentally pressed ‘publish’ while drafting it yesterday! Ah! So that’s what happened. I arrived here yesterday to find a “Page Not Found” message. Great review of what sounds to be a spiffy book. All the sections that you describe sound very interesting. In particular Rasputin sounds fascinating. He was such an intriguing and find some aways ominous figure. It says something that in almost every account of him that I read there is a reference to his eyes. I agree that the physical book looks marvelous. The cover is so clean and neat yet elegant. I once hit the dreaded “Publish” button prematurely. I pulled the post right away but it seems some folks received a copy in their email and/or blog readers. That can be frustrating! Thanks, Brian. I’m woefully under-read when it comes to the Russians, but I really enjoyed these stories. 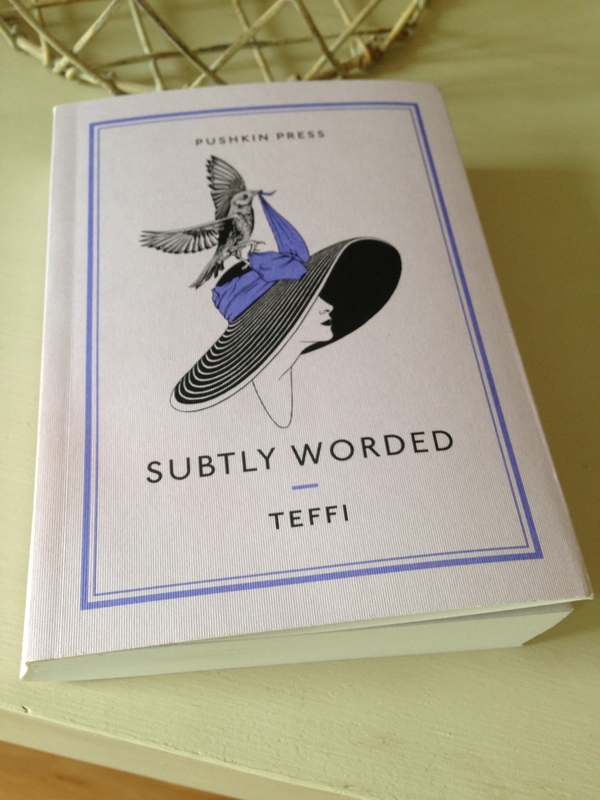 I’d never heard of Teffi until Pushkin published this collection, another neglected writer I’m glad to have discovered. I’m a sucker for ex-pat Russians, so it’s no surprise that I have this one on my shelf yet to read. Hope you enjoy it, Guy – I’ll be interested to hear what you think. A lot of care and attention has gone into the curation of this collection, plus there’s an excellent introduction by the lead translator, Anne Marie Jackson. I look forward to reading your review, Stu. Interesting comparison with Saki. I’ve yet to read any of his work, but I bought ‘Improper Stories’ off the back of Max’s review last year. His stories sound delightful – I’m sure I’ll enjoy them too. I loved the dry humour in Teffi’s early/mid-period stories, but the pieces in the final two sections evoke a strong sense of melancholy. The closing story ‘And Time Was No More’ is beautiful, sad and nostalgic all at once. I have this on the list. There’s a nice portrait of Teffi in Eric Dussert’s Une forêt cachée, a monumental French work regarding forgotten authors, in which he notes that Teffi’s stature among Russians exiled to Paris by the revolution, for whom she served as “the Great Writer in all her splendor,” was enormous. Dussert compares her to Anatole France. He also complains about the lack of translations of her work available in French (an exception, apparently, is a beautiful version of the Baba Yaga tales as told by Teffi), but points to several works available in English. As regards Naomi’s comment above, I’d like to add my support for Margarita Karapanou as a possible substitute for Teffi after your trigger-happy accidental posting. That’s good to hear, Scott – I think you’ll enjoy it. How intriguing! I would have liked to hear more about Teffi’s time in the literary circles in Paris. She comes across as quite a formidable figure, especially in the ‘Rasputin’ piece. I get the sense that she lived a fascinating life. The lack of availability of French translations is a shame, particularly given her move to Paris. As for women in translation, I’m about to start Madeleine Bourdouxhe’s La Femme de Gilles, which has been patiently waiting for its moment in the sun. Have you read it? Margarita Karapanou does sound very interesting though. Where would you suggest I start with her (once I’m allowed to buy books again)? Your recommendations are always welcome. Thanks for the link – pleased to be reminded of this wonderful collection. I particularly enjoyed the way you could follow her development as a writer through the years. Thanks, Grant. Very welcome, you did such a great job of reviewing this collection. I loved the diversity of pieces included here – it’s interesting to see the way her style and focus changes through the years. If anything I would have liked to hear more about her life as an émigré in Paris. She must have rubbed shoulders with so many writers, and I wonder how many other stories might exist. I love Pushkin titles as well! I also like their simple book covers, they are very distinct. It’s hard to go wrong with Pushkin, isn’t it? I love those covers too – they are beautifully designed and very elegant. I hope it will be one of the books I’ll get for my subscription. It sounds so good. the Rasputin chapter alone would make me want to pick it up. Ooh, it’s been out for about a year in the UK so it may have been included in last year’s subscription. Do you get an opportunity to choose any of the books or is it a fixed set? It might be worth contacting Pushkin to see if they could include it as part of your subscription? I think you’d like Teffi’s writing very much. Her stories are very diverse, and it’s interesting to see how the pieces change through the years. One gets the feeling that her approach to life altered quite markedly when she emigrated to Paris. The Rasputin piece is a highlight, a fascinating insight into his modus operandi. No, I don’t know in advance what I will get and in a way that’s part of the fun. I’m not sure they send only new publications, so it’s possible. I’ll have to wait and see. Or, before placing and order, I’ll ask them. Oh, I hope you receive a copy of this one – I’ll keep my fingers crossed for you. As you say, the surprise element is part of the attraction of these kinds of subscriptions…and with Pushkin Press, you know the books will be good. I’ve never heard of Teffi but now I’m really interested in reading her short stories. They exist in French but they don’t seem easy to find. That’s a shame as she seem to be a fantastic witness of her time. Thanks, Emma. I think you’d like her stories very much. She seems to have lived several different lives, each of them fascinating in its own individual way. I hope you’ll be able to get hold of her stories in French at some point (once you’re allowed to buy books again!). I can see why you directed me back to this review. I actually have this courtesy of that 99p kindle deal mentioned above, but it’s not really been on my radar. Perhaps for after my current #TBR20. Hurrah! It’s a bargain at 99p. I think you’ll appreciate these stories, Max, and there’s enough diversity to maintain your interest.